The Printer Configuration tool serves for printer configuring, maintenance of printer configuration files, print spool directories and print filters, and printer classes management. The cupsd.conf man page documents configuration of a CUPS server. It includes directives for enabling SSL support. However, CUPS does not allow control of the protocol versions used. Due to the vulnerability described in Resolution for POODLE SSLv3.0 vulnerability (CVE-2014-3566) for components that do not allow SSLv3 to be disabled via configuration settings, Red Hat recommends that you do not rely on this for security. It is recommend that you use stunnel to provide a secure tunnel and disable SSLv3. For more information on using stunnel, see the Red Hat Enterprise Linux 6 Security Guide. 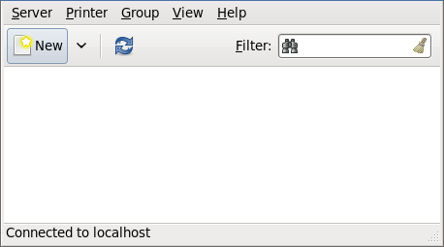 For ad-hoc secure connections to a remote system's Print Settings tool, use X11 forwarding over SSH as described in Section 14.5.1, “X11 Forwarding”. You can perform the same and additional operations on printers directly from the CUPS web application or command line. To access the application, in a web browser, go to http://localhost:631/. For CUPS manuals see the links on the Home tab of the web site. With the Printer Configuration tool you can perform various operations on existing printers and set up new printers. However, you can use also CUPS directly (go to http://localhost:631/ to access CUPS). On the panel, click System → Administration → Printing, or run the system-config-printer command from the command line to start the tool. The Printer Configuration window depicted in Figure 21.3, “Printer Configuration window” appears.